Brookhaven Retreat, a unique residential treatment facility exclusively for women, focuses on National Self-Injury Awareness Day on March 1. Brookhaven Retreat ® LLC, a unique residential treatment facility exclusively for women with mental health and/or substance abuse issues, will focus on National Self-Injury Awareness Day (SIAD) on March 1. SIAD is an annual global awareness campaign to promote openness and break down the common stereotypes about self-injury, also referred to as self-harm, which encompasses a wide range of non-suicidal behaviors and physical acts of harm to your own body to relieve emotional distress. Self-injuries may be inflicted as a way to create “real” feelings and divert attention from emotional issues that seem more difficult to tackle. However, self-injury does not address underlying issues and can become a habitual response to daily stress and eventually escalate in severity. According to Healthyplace.com, 1 in 5 females and 1 in 7 males engage in self-injury each year, and 90 percent of people who engage in self-harm begin during their teen or pre-adolescent years. Additionally, nearly 50 percent of those who engage in self-injury activities have been sexually abused. As part of The Lily Program ®, a 90-day program for women offered exclusively at Brookhaven Retreat, Dialectical Behavior Therapy (DBT) is integrated for clients who are affected by Borderline Personality Disorder (BPD) and exhibit self-harm. Dr. Marsha Linehan, the founder of The Linehan Institute of Behavioral Technology, developed DBT, which is considered by the Cochrane Review as the treatment of choice for characteristics associated with BPD, including self-harm, impulsivity and suicidal tendencies, among others. As Dr. Linehan was affected by BPD and self-injury as a young woman, she learned how to help others by first discovering how to help herself by creating a life worth living. DBT combines the technology of change based on behavioral science, “technology of acceptance,” derived from both eastern and western practices, such as mindfulness, willingness and radical acceptance. 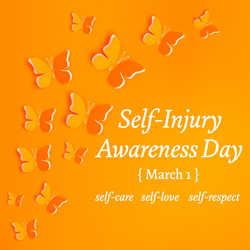 Self-Injury Awareness is often observed by the public with orange ribbons and orange SIAD bracelets. Brookhaven Retreat is a women's treatment center nestled on a naturally beautiful 48-acre site secluded in the foothills of the Great Smoky Mountains. It has helped hundreds of women across the United States overcome depression, trauma, anxiety, substance use and a range of other behavioral health challenges. Brookhaven’s Founder, Jacqueline Dawes, has predicated its gender-specific treatment on “healing emotional breakage” for women. In this way, she has established a sanctuary and a place where women can feel safe, secure and cared for by a staff of highly trained professionals.